World's largest 3D-Printed Rocket Engine is here. check out all we know about it. It's a long way from taking on Blue Origin or SpaceX, but UK startup Orbex is confident enough to show off its Prime Rocket's second stage. Inside the engineering prototype's shell is what it claims is the "world's largest" 3D printed rocket engine, which is also designed to run on bio-propane, a renewable fuel source. The rocket itself is made of a carbon fiber and aluminum composite that's supposed to be 30 percent lighter than any other vehicle in its category. So what will it carry with all of those weight savings? 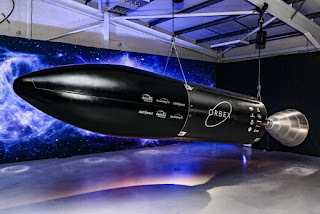 Orbex is aiming to pull off its first launch from Scotland in 2021, and has signed up Switzerland's Astrocast SA as a customer to launch 10 nanosatellites in 2023 to build out a global IoT network. Small satellite headed to sun-synchronous or polar altitudes are where Orbex expects to find business for this rocket, even if we have to wait a few more years before that actually happens.